Please tell me you’ve all tried a churro… a real churro? Not the long, freeze and bake churros they sale at theme parks, ball games or the mall. I mean freshly fried, made from scratch kind of churros. If you said no, stop what you are doing, drive home if you have to and make these. 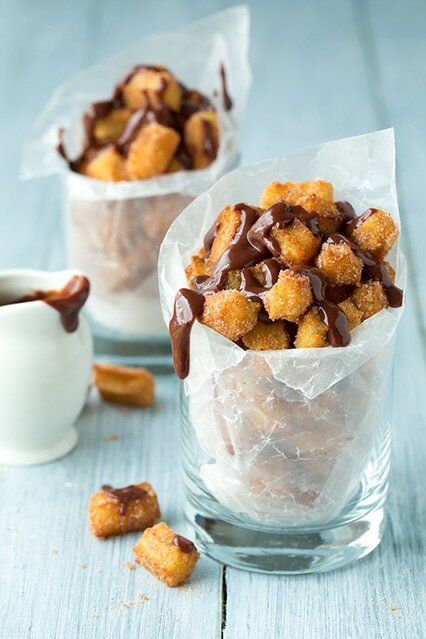 Life needs churros :). I love churros and yes I’ll admit, every now and then I will buy those churro sticks that are sitting in a warming oven at a shopping center because how do I resist that cinnamon sugar smell floating through the air, and then I have two kids and a husband smelling the same thing so we’re definitely doomed. There is no better advertising than the scent of good food and cinnamon is one of the best. Those little bakeries don’t need banners, signs or logos, they just need to continue to put their delicious, free smells through the air and we’ll keep stopping and giving in. 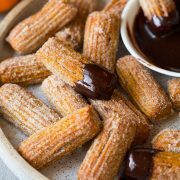 But please, hold out if you can and make churros at home, they are so much better. 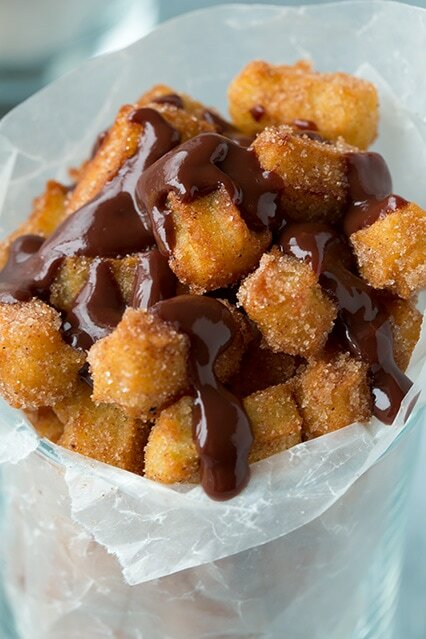 And yes, the classic churro sticks are delicious but I think it’s time for a new trend in churros. It’s like the soft pretzels, yes they are delicious in the whole form, but there’s something about the pretzel bites that’s just easier. Same with doughnut holes. Something about popping one into your mouth and grabbing another, and another until the bag is empty. It’s like it doesn’t disappear as fast or something, more savoring and more of that sweet coating. 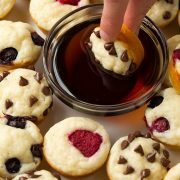 These really don’t need the chocolate sauce, they are completely delicious all on their own, so it is totally optional. When making these, be sure to properly heat the oil so you get that crisp exterior and soft interior. I’d also recommend using a star piping tip (you could probably do it without) but it will make those nice golden ridges extending out on all sides giving it the perfect bite and that classic churro look. Enjoy! Heat 1 1/2 inches of oil in a heavy bottom pot over medium heat to 360 degrees (Keep a close eye on the temp while you prepare the churro dough, you don't want it to become too hot, so you may have to reduce the temp or remove the pot from the burner for a moment). In a medium saucepan combine milk, water, butter, 2 tsp sugar, and salt and bring mixture just to a boil. Once it reaches a boil, remove from heat and immediately stir in vanilla and flour. Stir mixture with a silicone spatula while running dough along bottom of saucepan to smooth any lumps and stir until mixture comes together and is smooth. Transfer to a piping bag fitted with a large open star tip and carefully pipe about 1 to 1 1/2 inches of dough out over oil and using clean scissors, cut dough at top to allow dough to drop into oil (to make it faster I'd pipe about 2 - 3 inches out at time and would cut 2 at once then pipe more and repeat). Work in fairly small batches being careful not to overcrowd (which will reduce oil temperature too much. You want the oil to remain close to 350). 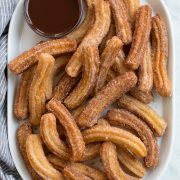 Allow churros to fry until golden brown (stirring occasionally near the beginning of frying will help keep them from sticking to each other) and remove with a wire skimmer and drain on a plate or baking sheet lined with several layers of paper towels. In a small mixing bowl, whisk together 1/2 cup granulated sugar and cinnamon. 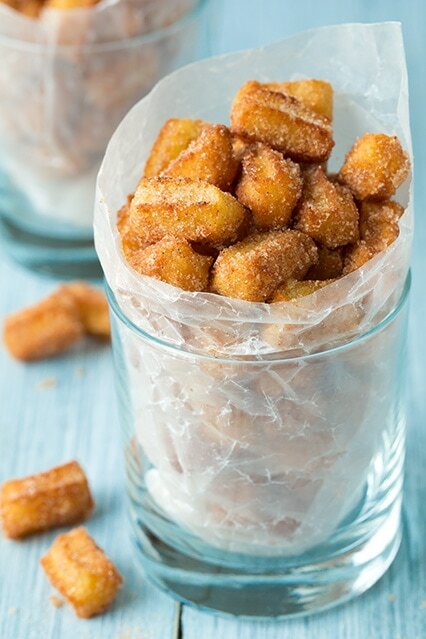 Toss warm, drained churros into sugar mixture to evenly coat. For best results serve warm with chocolate sauce if desired. ThNk you so much for posting this recipe! Can’t wait to try it out! The pictures look amazing. I wanted to know the shelf life of these. Like I make them today and then for how many days can they be stored and how.